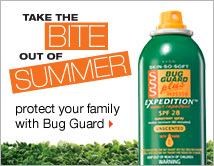 Enjoy your family time bug free with our BUG GUARD spray. Come by our location or visit us online at http://www.youravon.com/igrooms and enjoy our special price and nice smell. Spend more time with your family and less time fighting off insects. Exclusively from your Avon Representative TGL Fashion were we treat you like family. This entry was posted in Avon Independent Sales Representative and tagged Avon, Avon Columbus Ga, Avon Phenix City AL, Avon Products, Avon Representative by tglfashion. Bookmark the permalink.